Black Sapphire Metallic 2018 BMW X1 xDrive28i - Premium Pkg - AWD 8-Speed Automatic 2.0L 4-Cylinder DOHC 16V TwinPower Turbo Alarm System, Auto-Dimming Exterior Mirrors, Auto-Dimming Interior Mirror, Automatic Trunk, BMW ConnectedDrive Services Professional, Comfort Access, Convenience Telephony w/Smartphone Connectivity, Driver Assistance Package, Driving Assistant, Front & Rear Park Distance Control, Head-Up Display, Heated Steering Wheel, HiFi Sound System, Lumbar Support, On-Board Navigation, Panorama Sunroof, Park Assistant, Premium Package Enhanced, Satin Aluminum Roof Rails, SiriusXM Satellite Radio Tuner. We have a strong and committed sales staff with many years of experience satisfying our customers' needs. Feel free to browse our inventory online, request more information about vehicles, set up a test drive or inquire about financing! We look forward to serving you! 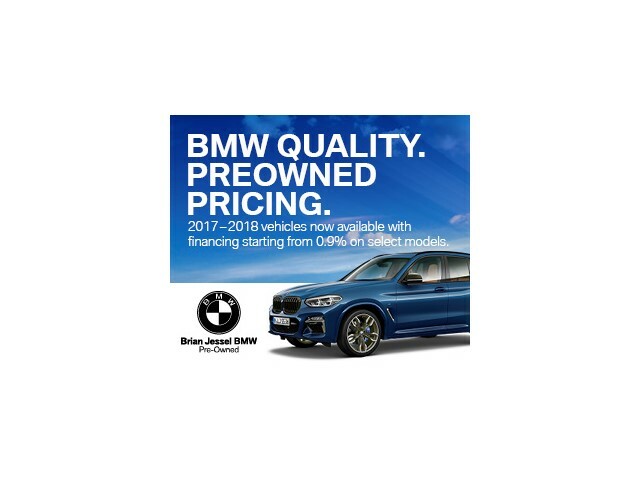 Because Brian Jessel BMW Pre-Owned is the largest BMW retailer in Canada, you know you'll benefit from the finest quality, selection and pricing for the purchase of a pre-owned car or SUV in Vancouver when you come to us. Whether you're looking for an economical second car or a premium-quality luxury pre-owned vehicle, we have what you're looking for. Le prix de ce véhicule est de 606 $ SUPÉRIEUR AU PRIX DU MARCHÉ (1%) pour la région de Vancouver. Il est comparé à des 2018 BMW X1 semblables et tient compte du kilométrage, de la transmission, de la version et des options. Bonjour, je souhaiterais obtenir plus d’information sur votre 2018 BMW X1 xDrive28i - Vancouver trouvé sur autoHEBDO.net.